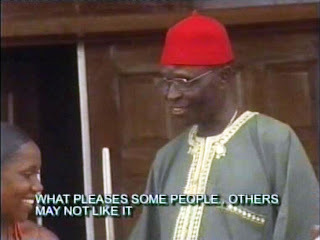 To me Chief Stephen Osita Osadebe has always been just that: the consistent highlife king. I mean, you can buy any of his albums. They are all great. My first lp of the -unfortunately late- chief was cleverly disguised as the work of the 'People Star'. It took me a while to find out who this master of mental massage really was. By then I had already found the first volume too. 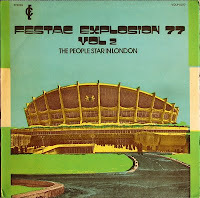 I have never understood why the albums are called Festac Explosion 77. They were recorded four years earlier in 1973. It is suggested that the release under a different name was due to "a licensing or copyright dispute", or that this record is a 'pirate' record. There may be a link with the departure in 1973 of members of Osadebe's orchestra to form the Ikenga Super Stars. But who cares, - after listening to this? Thanks for posting this. My copy of this record is hopelessly scratched and unplayable. "World Service" is off to an incredible start! P.S. : Any chance you can post Vol. 1 also? I'm listening to Vol. 2 now and it's great! wow, so many treasures here! Thanks.